Copyright © 2004 Stichting LogReport Foundation. We report on the activities of the LogReport team during 2003, LogReport's third full year. A more in-depth overview of what's presented in this document, specifically on Lire development, can be found in the Lire NEWS file, as well as in the various Lire roadmap documents, as shipped with the Lire releases during the year. (There's also a roadmap describing the development plans after August 2003.) A very detailed journal of changes in Lire is in the Lire ChangeLog file. Some highlights can be found on the LogReport history page too. On February 28, 2003, Joost van Baal's paid contract with LogReport (for 8 hours a week) ended. On June 30, 2003, Wessel Dankers' paid contract with LogReport (16 hours a week) ended. Both Wessel and Joost however plan to continue doing work for the project, by donating volunteer contributions. On May 31, 2003, the agreement between Francis Lacoste and the LogReport Foundation ended. Since August 19, 2003, Francis together with Wolfgang Sourdeau are paid for their work on Lire, under a new contract. Next to these people, involved in the LogReport project by having access to the LogReport server, or being on the logreport@logreport.org alias, are: Josh Koenig, Wytze van der Raay, and Egon Willighagen. At the July 3, 2003 LogReport board meeting, a new board got elected. Teus Hagen will no longer be a member of the board; Joost van Baal was elected as a new board member. Teus however will keep doing work for the project, as an advisor to the board. Wytze van der Raay and Jakob Schripsema will continue their positions in the board. The machine hibou.logreport.org hosts our website http://logreport.org/, provides the public LogReport Online Responder service, handles our email, and hosts the 4 public mailinglists: commit@logreport.org, announcement@logreport.org, questions@logreport.org, and development@logreport.org. Furthermore, it hosts a CVS repository for version control of non-public documents and hibou's configuration data. The Lire code development is done using CVS on SourceForge. Late 2002 the LogReport team noticed that hibou's bandwidth consumption was rising drastically. A search for additional low-cost or free bandwidth was started to limit the heavy bandwidth surcharges by LogReport's ISP. Since February 28, 2003, requests to http://logreport.org/pub/ get redirected to http://download.logreport.org/pub, which is currently pointing to 232pc232.sshunet.nl, a machine administered by Guus Sliepen (who is also donating the bandwidth to us.) Thanks a lot Guus Sliepen! On July 31 2003, hibou was moved from the VIA Networks facility in Eindhoven, to Amsterdam, The Netherlands: The NLnet Labs Foundation has offered LogReport a space in their machine room and free access over NLnet Labs' high-speed internet connection. LogReport of course gladly accepted this very generous offer. Thanks NLnet Labs people! Lire is free in both senses of the word: it is available gratis for download from the internet, and it is Free Software: it is licensed using the GNU General Public License. This means, among other things, anybody is free to study how the program works, and adapt it to ones needs; anybody is free to redistribute copies; and anybody is free to make modifications to the code, and to publish these modifications. The copyright on the major part of the code is held by Stichting LogReport Foundation. See also the Lire Contributor Guidelines for more information on licensing related issues. December 15, 17 and 27 Lire Debian package improvements: versions 1.4-3, 1.4-4 and 1.4-5 released. Since May 18, it is possible to install/upgrade Lire RPMS using apt-rpm (mainly for Red Hat) or urpmi for Mandrake. Since 1.4-1, Wolfgang has taken over maintenance of the Lire Debian package from Joost. Lire will very likely get shipped with the Debian "sarge" release, which will be released someday in spring 2004 (based upon information in this 21 Feb 2004 post). Since August 20, 2002, Lire is distributed with the FreeBSD ports collection (thanks to Edwin Groothuis' efforts.) See e.g. this URL. Lire 1.3 shipped with a major upgrade to the Lire internals. This resulted in a new and drastically improved DLF converter API: the new API supports multiple DLF schemas as well as log continuation. Furthermore, the configuration API was revised; it is now much easier to make extensions like DLF converter, analyzers, etc. configurable. The new improved lr_config(1) command makes use of this: it is now easier to configure periodical reports. Documentation was improved. The new internal APIs which should be used by extension developers are documented in manpages. A tutorial on how to write new DLF converters and DLF schemas is added to the Developer's manual. An extensive suite of unit tests and regression tests was added to Lire, making it easier to make new Lire extensions. DNS DLF converter for tinydns, as shipped with djbdns. Contributed by Christopher Boumenot. Email DLF converter for SunONE Messaging Server. Contributed by Jean-Yves Monnier. Firewall DLF converter for the Snort Open Source Network Intrusion Detection System. Contributed by Torsten Fellhauer. Firewall DLF converter for CheckPoint Firewall-1 NG 5.0, logging via OPSEC's LEA API. Contributed by Torsten Fellhauer. Of course, these contributions are very much appreciated. Thank you, volunteers! Next to many bugfixes, release 1.4 introduces a new report generation algorithm which improves performance a lot. DLF data is now stored in an SQLite database and the report is generated directly from the database. Tests show performance increases of ~18%-55% depending on the superservice used. Here is a table showing performance comparisons between running lr_log2report from Lire 1.3 and Lire 1.4 on various log files. This benchmark was run on a Debian GNU/Linux system running on an Intel Pentium III 600Mhz with 512Megs RAM. The Lire 1.4 release has undergone extensive testing on lots of platforms. We've been able to add FreeBSD, OpenBSD, NetBSD and Mac OS/X to our group of test platforms. was mainly a bugfix release. dns, dnszone bind8, bind9, tinydns BIND, the Berkeley Internet Name Domain by the Internet Software Consortium; tinydns as shipped with Daniel Bernsteins djbdns. email argomail, exim, nms, postfix, qmail, s1ms, sendmail ArGoSoft Mail Server, exim Internet Mailer, Netscape Messaging Server, Wietse Venema's Postfix, D.J. Bernstein's qmail message transfer agent, SunONE Messaging Server, the Sendmail Consortium's Sendmail MTA. firewall cisco_ios, fw1_lea, ipchains, ipfilter, iptables, pix, snort, watchguard, welf The Cisco IOS router, the Cisco PIX firewall, Linux ipchains, Linux iptables, Darren Reed's IP Filter, WatchGuard Firebox, all products supporting the WebTrends Enhanced Log Format like firewalls from Check Point, Check Point Firewall-1 5.0 using the LEA engine, Microsoft, Netscape and Sun Microsystems, the Snort IDS system. ftp iis_ftp, xferlog Microsoft IIS FTP Server, all FTP servers supporting the xferlog log format, like ProFTPD and WU-FTPD. msgstore dbmail, nmsmmp, nmsstore DBMAIL IMAP and POP server, Netscape Messaging Server Mail Multi Plexor, Netscape Messaging Server IMAP and POP engines. For DocBook XML, (X)HTML, RTF and PDF, images in PNG, JPG or EPS can be included. We do have figures about the number of downloads from our webserver. They're depicted in the graphic. 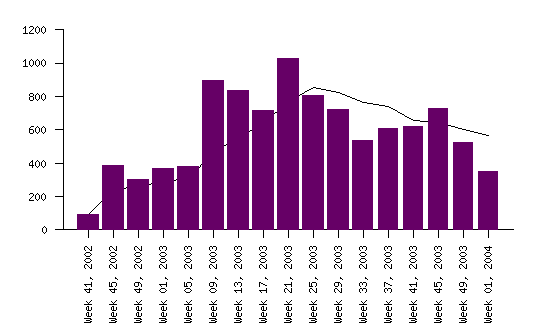 Number of Lire tarball downloads from http://logreport.org/ in 4-week periods during 2003. The number of tarball downloads has been growing during the year. Looking back at 2002, we're doing better also: in 2002, we've had 4-week periods with less than 500 downloads (which we hadn't in 2003), in 2002, the best period had less than 900 downloads (in 2003, we've had 2 periods with more than 1000 downloads). 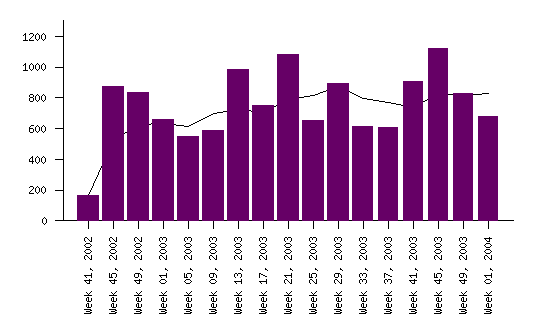 Number of Lire RPM package downloads from http://logreport.org/ in 4-week periods during 2003. The number of RPM downloads has been rising a lot during 2003. When comparing these figures with 2002, the difference is even more convincing: in 2002, we've had 2 periods with less than 200 downloads (in 2003, we've had more than 300 downloads in every period), in 2002, we never had more than 400 downloads (in 2003, we've had over 800 downloads during 3 periods). We have about doubled the RPM download traffic in 2003, compared with 2002. Based on the Debian Popularity Contest, the number of people who've installed a Lire Debian package grew from 330 in January 2003 to 600 in December 2003. Please note that Lire is also available for download directly from Sourceforge. The Sourceforge-supplied statistics show us the number of monthly downloads fluctuated during the year, with a total of about 1500 downloads for 2003. During the entire year, we've been running a so called Online Responder on log@<service>.logreport.org>. People can send their log files via email or submit them via a web page, and get a report back. During the year, the number of weekly users using the Responder has grown from about 25 to about 50. About 100 log files get submitted for analysis weekly. During the year, the number of external people subscribed to the announcement mailing list grew from about 90 to about 200. (Early 2002, we had 24 announcement subscribers.) Subscribers on the development list grew from 35 to 45, while the number of subscribers on the questions list grew from 55 to 90. This is an overall growth of more than 50% for the 3 lists during 2003. We're very happy at this growing interest in LogReport and Lire! About once every other day an external interested person posts to any of LogReport's mailing lists or group adresses. We've tackled the spam problem we've been suffering from in early 2003. This made being subscribed to the lists unattractive in the late 2002 period. We now have a policy which executes automatic distribution of posts only from subscribers. Posts from others are moderated manually. Hosting these open lists has been very helpful at building an active and contributing user community: in the third year, the LogReport project consolidated its true Open Source character. See the next section for the details. Lots of people suggested improvements and reported bugs, using our mailinglists. Furthermore, code was contributed by external developers. We name a few of the people who have contacted us via our public mailing lists during the year, suggesting improvements and reporting bugs. These contacts give reason to believe these people do use Lire to do their work. In 2003, we've been contacted by various developers and users. We'll give a list of the main contacts. Ing. Massimiliano Ciccarelli from Defence division of Italian Software and IT Service supplier Datamat S.p.A.
Apart from these people, the LogReport developers have been contacted privately by lots of ISP's, network hardware manufacturers and players in the Financial and Industry markets. It's clear we have established quite a user base: lots of downloads and lots of feedback. The following code contributions have been made to Lire in 2003. On January 8, 2003, a convertor for the SunONE Messaging Server by Jean-Yves Monnier from Sun Professional Services was contributed. In March 2003, Torsten Fellhauer, of FW1-Loggrabber fame, has contributed a Firewall DLF converter for the Snort Open Source Network Intrusion Detection System, as well as a Firewall DLF converter for CheckPoint Firewall-1 NG 5.0, logging via OPSEC's LEA API. In March 2003 Christopher Boumenot contributed a DNS DLF converter for tinydns, as shipped with djbdns. All these contributions have been integrated and come with Lire, since Lire 1.3. Mika Boström has written a book on home users' basic computer security, "Kotimikron Tietoturva", ISBN 951-762-813-7, published by Talentum (the book is available in Finnish only). It includes a cover CD with suitable tools and software, including the Lire 1.2.1 source release. LogReport is mentioned on the LogAnalysis Generic Log Parsing Tools webpage. In July, Wessel Dankers gave a Lire demo at Tunix, the people working on the Tunix Firewall product. Wessel worked together with Jan E. Kuba van Bijnen, installing Lire on a Tunix test box, and explaining Lire internals. In 2002, we had on average about four people working on the LogReport project (Josh Koenig, Wessel Dankers, Joost van Baal, Francis Lacoste). In 2003, we had only two most of the time: Francis with either Wessel or Wolfgang. During approximately two months, nobody was working on paid development for LogReport. In 2002, we shipped four major Lire releases. In 2003, we shipped two. Still the LogReport team has managed to keep the extended LogReport community vivid. The LogReport board is very grateful and would like to thank the 2003 LogReport team for this amazing achievement. In July 2003 Francis Lacoste wrote a proposal for implementing substantial improvements of the Lire software, culminating in a Lire 2.0 release which would be able to survive by true Free Software maintenance. The plan was submitted to Stichting NLnet to request funding, and the funding (€38.000) was granted. Many thanks to Stichting NLnet for (once more) providing major financial support to the LogReport project! Since August 19, Francis is contracted by LogReport, to complete Lire 2.0. The work is done by both Francis and Wolfgang Sourdeau. The development contract will end 3 weeks after the public Lire 2.0 release, or on August 1, 2004, whichever comes first. No activities from the LogReport Foundation are expected after the release of Lire 2.0. However, with the Lire 2.0 framework in place, and given the stable and growing Lire user base, we foresee a bright future for the Lire Free Software product. We look forward to see further community-contributed evolution, but also to see e.g. consultants offering tailor-made solutions based on the Lire 2.0 framework. The composition of the board changed in its meeting of July 3, 2003: Teus Hagen resigned as chairman and board member, and Joost van Baal, who attended previous board meetings as liaison with LogReport operations, was elected in his place. Teus Hagen is retained as advisor to the board. The responsibility for day-to-day administration, handling of payments and other similar activities rests with Joost van Baal. The bookkeeping function has been taken care of by Wytze van der Raay, treasurer of the foundation. The salary administration and related work (interfacing to UWV GAK, ARBO service etc) has been contracted out to De Wert Accountants in Eindhoven. The latter contract has been ended since the foundation does not directly employ staff anymore since July 1, 2003. The fiscal year of Stichting LogReport Foundation coincides with the calender year. Thus the (fourth) fiscal year of the foundation ran from January 1, 2003 until December 31, 2003. Assets and liabilities. Unless stated otherwise, assets and liabilities have been stated at their nominal values. Material fixed assets. Material fixed assets have been stated at historical cost price, reduced with depreciation calculated linearly based on the estimated total useful life of the corresponding fixed asset. General. The following holds with respect to items included in the operational result: profits are only included if and for the part they have been realized in the reporting period, and losses and risks have been taken into account inasmuch they originate before the end of the reporting period. The foundation has engaged in a fixed price contract for development of Lire 2.0 software with Francis Lacoste in Montréal, Québec, Canada; the remaining costs of this contract for 2004 are 30,400.00. Income over 2003 consists of two donations from Stichting NLnet, a donation of 5,000.00 at the start of the year for LogReport operations, and a donation of 38,000.00 in September 2003 for the Lire 2.0 development project. In anticipation of a board decision to be taken, the net result over 2003 ad 6,731.08 has been added to the reserve fund.